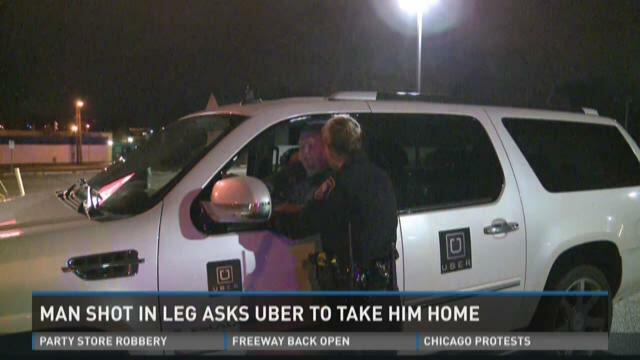 GRAND RAPIDS, Mich. (WZZM) -- A man is shot and instead of calling for help, he calls for an Uber driver in Grand Rapids. WZZM 13 spoke to the Uber driver who picked up the shooting victim outside of J Gardella's in downtown Grand Rapids just after midnight on Thursday morning. "(I) tried to get him to go to the hospital, he would not do it, refused to do it," said Heinicke. Heinicke says he received a call to pick up the 20-year-old man. "Looked like a handkerchief or something tied around his leg, trying to stop the bleeding. You could see right into his leg and the big crease down his pants where something had obviously hit him in the leg, and he later told me he had been shot by a .22 pistol." "(He) said if I didn’t take him here, he was going to get out and walk the rest of the way, so I brought him here," said Heinicke. "Then I called the police, and that’s why you’re here." At this point, Grand Rapids police say it's not clear where the shooting happened, but they don't believe it happened near Gardella's. The Uber driver told WZZM 13 that the man's friends didn't suggest taking him to the hospital, either. "Sometimes you can help people with what’s going on, and sometimes people don’t want to be helped," said Heinicke. However, the shooting victim eventually made it to the hospital. Police say his injuries are non-life threatening. Police don't have a suspect in custody. Earlier, they were waiting until the victim became sober to interview him.